For years I made Boston Cream Pie on Valentine’s Day for my kids. I loved putting little chocolate hearts around the edge of the cake and I loved that it had such a gorgeous old fashioned look with the glaze dripping down and the custard peeping out. It reminded me of those cakes that Yogi Bear stole along with the Pahnicanic baskets. 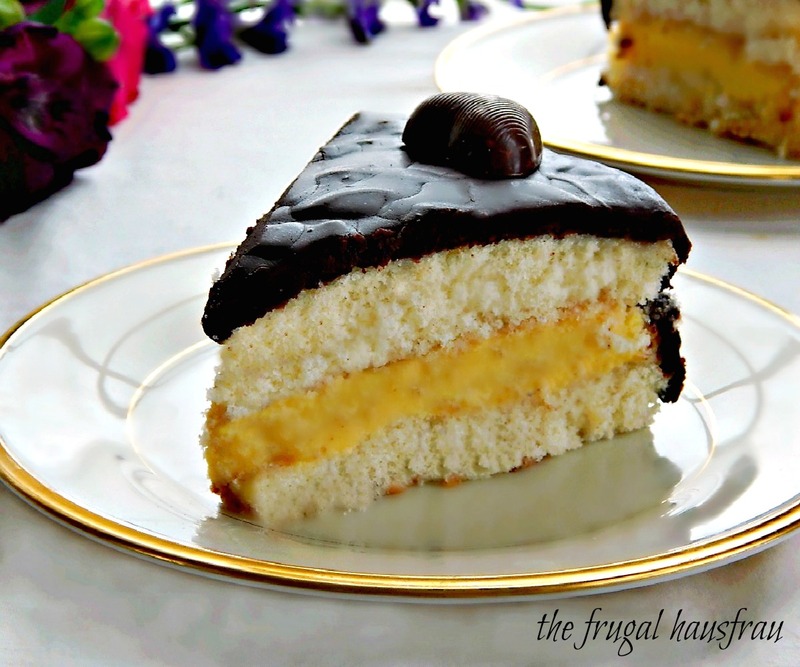 I do have a long-standing love affair with Boston Cream Pie; as a young teen we’d often gather at a friend’s house and make one after school, then devour it! Gosh to be able to eat like that again! This Boston Cream, though, is a combo of many recipes. It’s not yo’ Momma’s Boston Cream Pie, lol, unless you’re one of my kids! For years I made a version from the Betty Crocker Cookbook, then I switched to the Cook’s Illustrated version – I was seduced by the pastry cream. I still use it, and tell me you don’t want to just dive into it! Then I ended up with kind of a Frankenstein cake, with the BC cake, the CI pastry cream and a slight variation of the CI glaze. It’s really the best of all worlds. And the Betty Crocker Cake is so simple which gives you plenty of time to work on the custard and the glaze. Try it and let me know if you don’t think so, too! I know the cake in the photo is a bit sloppy – but honestly, I served this for a birthday party (my stepmom was 89 last week!) and there wasn’t much left by the time I got around to taking a pic the next day…what is it with the first/last pieces never coming out right, anyway?? Heck, that’s real life, eh?!! Just a hint: I hurried along my glaze by placing it in the fridge and it was a bit cool when I poured it over the cake…so be careful that it is at just the right temp if you want a lovely, flawless finish. Make sure to have a use for the additional egg whites, an omelette or perhaps a meringue. Make the Betty Crocker Basic White Cake in two 8″ layer pans. Cool and trim off top if rounded. Brush off any crumbs. Make the Rich Chocolate Glaze. While glaze is cooling, place one cake layer on a cardboard round on cooling rack set over waxed paper, bottom side up. Carefully spoon pastry cream over cake and spread evenly up to cake edge. Place the second layer on top, making sure layers line up properly. Pour glaze over middle of top layer and let flow down cake sides. Use a metal spatula, if desired, to completely coat cake. Let sit until glaze fully sets, about 1 hour. Serve. Heat milk in a small saucepan until hot but not simmering. Whisk yolks, sugar, and salt in a large saucepan until mixture is thick and lemon-colored, 3 to 4 minutes. (This may be whisked with an electric beater and then transferred to a pan.) Add cornstarch; whisk to combine. Slowly whisk in hot milk. Cook over medium-low heat, whisking constantly and scraping pan bottom and sides as you stir, until mixture thickens to a thick pudding consistency and loses all traces of raw starch flavor, about 10 minutes. To ensure that pastry cream does not thin out, do not whisk once it has set, simply spoon it carefully on top of the first layer of cake. Bring cream and corn syrup to a full simmer over medium heat in a medium saucepan. Off heat, add chocolate; cover and let stand for 8 minutes. (If chocolate has not completely melted, return saucepan to low heat; stir constantly until melted.) Add vanilla; stir very gently until mixture is smooth. You know I’ll be bringing this to our Throwback Thursday #24 Link Party, hosted by Quinn of Dad What’s for Dinner, Meaghan of 4 Sons are Us, Alli of Tornadough, and Moi! That’s right – me! Click over to our Throwback Thursday post for links to their blogs and social media, rules and more info or just click on the blue leapfrog, below, to view all the posts or enter your own! I’ll also be linking this to Fiesta Friday Number 104. FF is a link party put on by Angie, and cohosted this week by Mila @ milkandbun and Hilda @ Along The Grapevine. Stop over and join in! This entry was posted in Click here for Fabulous Food Posts and tagged Cake, Chocolate, Cook's Illustrated, custard, Desserts, Frosting, Frugal Hausfrau, glaze, pastry cream, white cake. Bookmark the permalink. Thanks, Hilda, and thanks for hosting Ff!! That looks delicious. I have been looking for a good pastry cream recipe. If you and Cook’s Illustrated say this is the one, I believe it! Would you believe that I haven’t made Boston-cream pie yet? What a delicious looking Boston Cream Pie, I don’t think I’d be able to stop at just one piece. Boston cream is my absolute favorite cake of all time. It was my requested cake for every birthday. I love it so much my Mom developed a recipe for the cake that most closely resembles the bakery we always bought it from until we moved. I never make it because I would literally eat the whole cake, not at one time of course but I get selfish when it comes to this cake. Your recipe sounds wonderful and I can well imagine how hard it must have been to snap a photo with everyone diggining in. Hi Suzanne, I’d LOVE to see your version – it’s one of my faves, too. And yeah, it’s hard to stop, lol! Same here! VD day is always a little weird when you’re a single mom! Josette, I think my fave was when my son was about 8 or 9 he snuck off to the corner store and bought me a chocolate heart – but on the way back, he ate half of it. He said Here, Mom, I knew you’d give me half anyway!! LOL!! Too cute. It’s the thought that counts- right? Ok, too many ppl are mentioning donuts! I think I’m going to have to make some! LOL!